Nokia announced their new smartphone Nokia Lumia 1020 at the event in New York today. The phone comes with a massive 41 MP camera sensor similar to the 808 Pureview model, 2nd generation of Optical Image Stabilization (OIS), Xenon Flash and Zeiss optics with six lenses. • Nokia built a brand new Camera Pro app that replaces default camera app, which allows the users to adjust flash, focus, white balance, shutter speed, exposure and other editing features manually. You can see this changes before you take a shot. • Dual Capture – Nokia Pro Camera app takes pictures in full resolution and oversampled images in 5 MP simultaneously. You can easily share the 5 megapixel images on social networks or SkyDrive. • Optical Image Stabilisation helps to take videos without shakes. You can Reframe and re-zoom to make different images from one single shot. There is Xenon Flash for images and LED flash for taking videos. • Apart from Camera features, Nokia Lumia 1020 has 1.5 GHz dual core processor, 4.5" AMOLED display, 2 GB RAM, 32 GB storage and more. See below the complete specifications. • 1.2 MP front facing camera with wide angle lens. • Nokia Pro Camera app. 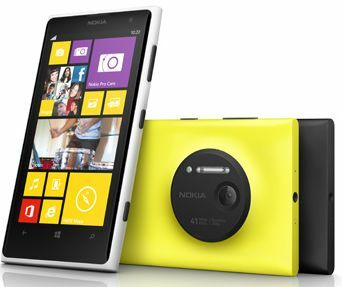 Nokia Lumia 1020 comes in three colors are Black, White and Yellow. It will be available first to US on AT&T and the sales expected to start from July 26, 2013.